We humans are doing a bang-up job of messing up our home planet. But who’s to say we can’t go on to screw things up elsewhere? Here, not listed in any particular order, are 12 unintentional ways we could do some serious damage to our Solar System, too. Above: We could cause some serious damage with a Shkadov Thruster (see #7). Credit: L. Blaszkiewicz/CC. By accidentally unleashing exotic forms of matter from particle accelerators, we run the risk of annihilating the entire solar system. Prior to the construction of CERN’s Large Hadron Collider, some scientists worried that collisions created by the highly energetic accelerator might spawn such nasties like vacuum bubbles, magnetic monopoles, microscopic black holes, or strangelets (a.k.a. “strange matter” — a hypothetical form of matter similar to conventional nuclei, but also containing many of the heavier strange quarks). These concerns were condemned by the scientific community as “rubbish” and nothing more than rumors spread by “unqualified people seeking sensation or publicity.” Moreover, a 2011 report published by the LHC Safety Assessment Group concluded that the collisions presented no danger. Converting even a planet like Mars to strange matter would release a fraction of the rest mass as radiation (plus perhaps splatter strangelets). Assuming a conversion acting on a hour timescale and releasing just 0.1% as radiation gives a mean luminosity of 1.59*10^34 W, or about 42 million times the sun. Most of which would be hard gamma rays. We could also wreck the Solar System by severely damaging or altering the Sun during a stellar engineering project, or by screwing up planetary dynamics in the process. Some futurists speculate that future humans (or our posthuman descendants) may choose to embark upon any number of stellar engineering projects, including stellar husbandry. Writing in Interstellar Migration and the Human Experience, David Criswell from the University of Houston described stellar husbandry as the effort to control the evolution and properties of stars, including attempts to prolong their lifespans, extract material, or create new stars. To make a star burn less rapidly, and thus last longer, future stellar engineers would work to remove its excess mass (big stars expend fuel faster). Some thought has been given to the prospect of turning Jupiter into a kind of artificial star. But in the attempt to do so, we could destroy Jupiter itself and wipe out life on Earth. Jupiter transforming into the Lucifer star in 2010: The Year We Make Contact. Lovely, except for what would happen if things go askew. As Sandberg told io9, it would work fine at first — but the black hole could grow and eventually absorb Jupiter in a burst of radiation that would sterilize the entire Solar System. With life extinguished and Jupiter sucked up into a black hole, our neighborhood would be a complete mess. Should we start to mess around with the location and mass of planets or other celestial bodies, we run the risk of upsetting the Solar System’s delicate orbital balance. The orbital dynamics in our Solar System is surprisingly fragile. It has been estimated than even the slightest perturbation could result in chaotic and even potentially dangerous orbital motions. The reason for this is that planets are subject to resonances, which is what happens when any two periods assume a simple numerical ratio (e.g., Neptune and Pluto are in a 3:2 orbital resonance, as Pluto completes two orbits for every three orbits of Neptune). The result is that two orbiting bodies can influence each other even when they’re quite distant. Regular close encounters can result in the smaller object getting destabilized and cleared right out of its original orbit — and even the Solar System altogether! A spaceship driven by a warp drive would be awesome, no doubt, but it would also be incredibly dangerous. Any object, like a planet, at the destination point would be subject to massive expenditures of energy. Also known as an Alcubierre engine, a warp drive could someday work by generating a bubble of negative energy around it. By expanding space and time behind the ship, while squeezing space in front of it, a ship could be pushed to velocities not limited by the speed of light. Space is not just an empty void between point A and point B… rather, it’s full of particles that have mass (as well as some that do not.) What the research team...has found is that these particles can get “swept up” into the warp bubble and focused into regions before and behind the ship, as well as within the warp bubble itself. Using wormholes to sidestep the constraints of interstellar space travel sounds great in theory, but we’ll need to be extra careful when tearing a hole in the space-time continuum. Back in 2005, Iranian nuclear physicist Mohammad Mansouryar outlined a scheme for creating a traversable wormhole. By producing enough amounts of effective exotic matter, he theorized that we could theoretically pierce a hole through the cosmological fabric of space-time and create a shortcut for spacecraft. First, wormhole throats need mass-energy (possibly negative) on the scale of a black hole of the same size. Second, making time loops may cause virtual particles to become real and break down the wormhole in an energy cascade. Likely bad for the neighborhood. And besides, dump one end in the Sun and another elsewhere (a la Stephen Baxter’s Ring), and you might drain the Sun and/or irradiate the solar system if it is large enough. Yes, killing the Sun is bad. And by irradiation we’re once again talking about the complete sterilization of the Solar System. Should we choose to relocate our Solar System in the far future, we run the risk of destroying it completely. 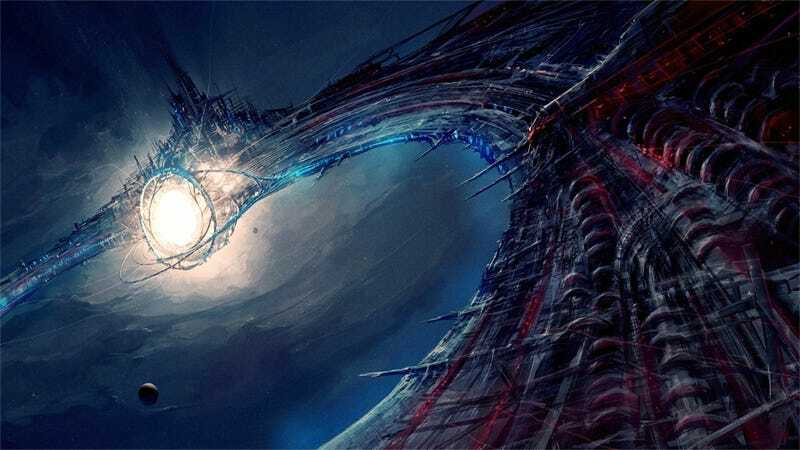 In 1987, Russian Physicist Leonid Shkadov proposed a megastructure concept, since dubbed the Shkadov Thruster, that could literally move our solar system and all that’s within it to a neighboring star system. In the future, this would allow us to reject our older, dying star in favor of a younger version. The Shkadov Thruster setup is simple (in theory): It’s just a colossal, arc-shaped mirror, with the concave side facing the sun. Builders would place the mirror at an arbitrary distance where gravitational attraction from the sun is balanced out by the outward pressure of its radiation. The mirror thus becomes a stable, static satellite in equilibrium between gravity’s tug and sunlight’s push. Solar radiation reflects off the mirror’s inner, curved surface back toward the sun, effectively pushing our star with its own sunlight—the reflected energy produces a tiny net thrust. Voilà, a Shkadov Thruster, and humanity is ready to hit the galactic trail. What could go wrong, right? Clearly, lots. We could miscalculate and scatter the Solar System to the cosmos, or even smash directly into the other star. Say we send out a fleet of exponentially self-replicating von Neumann probes to colonize the Galaxy. Assuming they’re programmed very, very poorly, or somebody deliberately creates an evolvable probe, they could mutate over time and transform into something quite malevolent. Somewhat similar to self-replicating space probes, there’s also the potential for something much smaller, yet equally as dangerous: exponentially replicating nanobots. A grey goo disaster, where an uncontrollable swarm of nanobots or macrobots consume all planetary resources to create more copies of itself, need not be confined to planet Earth. Such a swarm could hitch a ride aboard an escaping spaceship or planetary fragment, or even originate in space as part of some megastructure project. Once unleashed in the Solar System, it would quickly turn everything into mush. One of the dangers of creating artificial superintelligence is that it has the potential to do much more than just snuff out life on Earth; it could spread out into the Solar System — and even potentially beyond. This post was originally published on April 10, 2015. Many thanks to Anders Sandberg for his many contributions to this list! And a h/t to James D. Miller for suggesting #12.